Michael Jackson’s only daughter, Paris, was outraged and deeply offended by a portrayal of her father in a new comedy series. Sky Arts caused controversy a year ago when they announced they had cast Joseph Fiennes as the King of Pop in their new show Urban Myths: A Brand New Collection of Comedies, and have sparked more with the release of the trailer yesterday. Paris took to Twitter to slam the portrayal which stars Fiennes as MJ in a tale about his alleged roadtrip across America with Elizabeth Taylor and Marlon Brando after 9/11. I’m so incredibly offended by it, as i’m sure plenty of people are as well, and it honestly makes me want to vomit. It angers me to see how obviously intentional it was for them to be this insulting, not just towards my father, but my godmother Liz as well. Where is the respect? They worked through blood sweat and tears for ages to create such profound and remarkable legacies. Shameful portrayal. The 18-year-old actress and model responded to the MJ Cast twitter account who were ‘sickened’ by it. Ohh hell nooo! Joseph Fiennes as Michael Jackson is terrifying, they should have just casted one of them impersonators lurking the streets. I hope people stop sharing that Joseph fiennes picture as Michael Jackson. It's really scary and disturbing. I think Joseph Fiennes will make an excellent Michael Jackson. Can't wait! 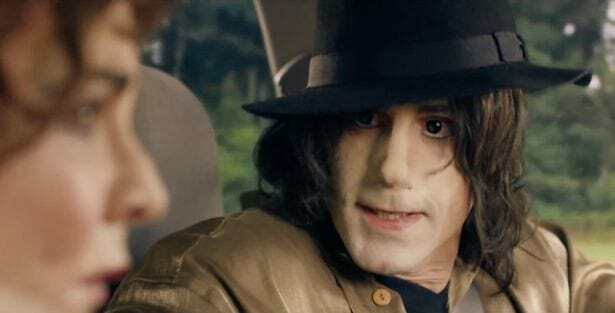 Joseph Fiennes as #MichaelJackson is brilliant! Laughed during the trailer. If only people understood the context and concept! It was argued that, after all his plastic surgery, Michael Jackson had white skin, so it would make sense to use a white person in a physical portrayal of him. The series features a collection of myths about famous faces and leaders, with Stockard Channing playing Elizabeth Taylor, and Brian Cox as Marlon Brando. Sky describe the series as ‘tongue-in-cheek’ and ‘mischevious’ and Fiennes said ‘It’s a light comedy look. It’s not in any way malicious. It’s actually endearing’.